WASHINGTON (CNN) -- The search for a Supreme Court nominee has been trimmed to about half a dozen candidates by top White House officials, and an announcement may come by month's end, two sources close to the selection process tell CNN. 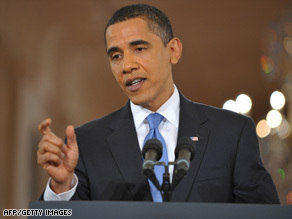 Presidnet Obama says he wants his nominee to be in place before the Supreme Court's next session. Among the finalists are federal appeals court judges Sonia Sotomayor and Diane Wood, and Solicitor General Elena Kagan, Homeland Security Secretary Janet Napolitano and Michigan Gov. Jennifer Granholm, said the sources, who asked not to be identified because they were not authorized to speak by the White House. Women make up all but one of the top candidates currently being given serious scrutiny, the sources said. Moreno was a federal trial judge before his 2001 appointment to California's top court. A new round of vetting the finalists' records is under way by a small group of top staff led by the White House counsel's office, the sources said. Vice President Joe Biden, Chief of Staff Rahm Emanuel and senior adviser David Axelrod are also extensively involved. Sources say some administration officials are pushing for an announcement before the Memorial Day weekend, when Congress goes on recess for a week. A bipartisan group of senators including Senate Majority Leader Harry Reid, D-Nevada, and Senate Judiciary Committee's chairman, Sen. Patrick Leahy, D-Vermont, Senate Minority Leader Mitch McConnell, R-Kentucky, and Sen. Jeff Sessions, R-Alabama, the ranking Republican on the Judiciary Committee, all met in private with President Obama Wednesday about the upcoming vacancy. "My impression was [Obama] doesn't want to let it take too long," Sen. Jeff Sessions, the top Republican on the Judiciary Committee, told reporters after the meeting. Sen. Patrick Leahy, D-Vermont, chairman of the committee, which will hold confirmation hearings, refused to offer a timetable for consideration of the nominee. He said it will depend on how soon a choice is named. McConnell said he is optimistic that a confirmation vote can happen quickly. "Unless the president sends up a very controversial nominee, the vote should occur well in advance of the first Monday in October, which is when the court reconvenes," McConnell said. Both McConnell and Sessions said they hope Obama will not name what they call a "judicial activist" as his nominee. "I didn't recommend anyone, but I do believe that someone who is not a judicial activist would be best for the country. Someone who does take the law as written seriously. Someone who does not confuse the role with that of a legislator, and hopefully the president will name someone along those lines," McConnell said. Sessions added, "We are hopeful that a nominee will come forth that is a unifying nominee that we can all support." Asked if Senate Republicans would consider using a filibuster, McConnell said, "We'll take a look at the nominee and respond appropriately." A filibuster is a tactic of the minority party in the chamber that can stall or kill a bill or a nomination before the whole Senate. Sixty votes are needed to end a filibuster. White House press secretary Gibbs said the president is hopeful hearings and a vote by the full Senate will be completed before the monthlong August recess. Leahy said he expected the next justice to be ready when the high court returns to work in late September. Several names on the short list have no judicial experience, sources said. Those include Kagan, Napolitano and Granholm, the sources said. They said Sen. Claire McCaskill, D-Missouri, also was receiving serious consideration in recent weeks. Leading candidates from the federal bench that have been vetted are appeals court judges Merrick Garland in the District of Columbia, Ann Claire Williams in Illinois, and Kim Wardlaw in California. Sources say the list of finalists may expand depending on face-to-face meetings Obama has with the current top-tier candidates. The White House has given no public indication whether those personal meetings have concluded. The nominee would replace Justice David Souter, who announced he will step down after 19 years on the bench when the high court term recesses for the summer in late June. Sotomayor -- The 54-year-old judge on the 2nd U.S. Circuit Court of Appeals would be the first Hispanic justice. She was named a district judge by President George H.W. Bush in 1992, and was elevated to her current seat by President Bill Clinton. Supporters say that appointment history, along with what they call her moderate-liberal views, would give her some bipartisan backing in the Senate. But she has suffered through recent stinging criticism in the media and blogs from both the left and right over perceived -- some defenders say invented -- concerns about her temperament and intellect. Some Hispanic groups expressed concern after a skit last week on "The Late Show with David Letterman" compared Sotomayor with a noisy Spanish-speaking judge on a popular TV courtroom show that settles petty legal disputes. Kagan -- As the administration's top lawyer when arguing before the Supreme Court, her recent confirmation hearing was a breeze, with leading conservative lawyers voicing their support. She has been touted for consensus-building skills she showed as the recent leader of Harvard Law School. At age 49, she has no judicial experience, which some insiders say can be viewed as either a political asset or liability. Sources say Kagan's profile has risen somewhat among White House officials looking at the pros and cons she would bring. Some conservative legal activists privately believe she would be more "reasonable" in her views on executive power than other contenders. Wood -- Considered one of the sharpest minds on the Chicago, Illinois-based appeals court, she also teaches part time at the University of Chicago, where she met former fellow instructor Obama. They have remained casual, but not close, friends since then. At 59, she is among the oldest candidates being given serious scrutiny for the high court. Sources say the age of the nominee will be a key selection criteria, since justices have lifetime appointments and the longer they serve the greater the potential legacy for the president. "It isn't the main criteria, but certainly the president is looking for a justice who will be an intellectual force on the court for many years to come," said one source close to the selection process. Sources say Obama told colleagues privately he has great respect for the records of federal appeals judges such as David Tatel, Diana Motz, Jose Cabranes, and Amalya Kearse, as well as constitutional scholar Laurence Tribe, but is aware all are at least 65. President George W. Bush's two successful 2005 choices -- Chief Justice John Roberts and Samuel Alito -- are still in their 50s.